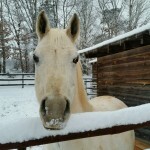 I know most of my horsey friends in North Carolina are well and truly fed up with the winter weather. Especially those of us on the front lines who take care of the manual labor of looking after the horses. The winter of 2017/18 has been one of the coldest on record for the southern United States. Our northern neighbors like to mock us when we complain about the weather but we just don't have the infrastructure to cope with it for days on end. The extreme cold makes everyday chores take much longer than usual and require more physical strength. If you board your horse please take a few minutes to thank your barn manager and barn hands for their hard-work in all weather conditions. So, as we patiently wait for a thaw from this frozen tundra here is a lighthearted look at some things your barn manager will never say, in winter. Oh good a snow day. Breaking ice off of water troughs is my most favorite thing to do. Mucking out twice, and sometimes three times, in a day is awesome. Going through twice as much hay because the horses are in all day makes me so happy. I love it when the ends of my fingers turn blue, it really sets off my perfectly manicured nails. Dragging water to the barn in coolers is so much fun. I wish it would snow again. Changing blankets every five minutes because the temps keep changing helps to tone my biceps. I can't wait to ride my bi-polar mare, who's been standing in her stall for days. I think I'll call in sick today. I wish the weather could stay like this forever. Taking care of horses is a labor of love and looking forward to spring is what is currently keeping me going. We'd love to hear from you. Let us know some of the things your barn manager never says in winter and follow us on Facebook. 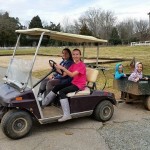 White Rose Equestrian is a small, private, full-service equestrian facility located in Iron Station, NC. 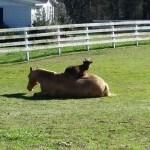 Posted in Fun at the barn, Random Musings. Tags: horses, ice, snow, winter on January 18, 2018 by Carol A. Mejia. I don't claim to know anything about football (American Football to my British readers) and have been known to ask questions when watching a game. It doesn't happen often as I would rather watch paint dry but that's another story altogether. One thing I would never do is comment or give my opinion or try to look like an expert on the subject but I'm sure I've asked a dumb question every now and then. Here are some things non-horsey people have said to me over the years. I know this will resonate with my horsey friends. What do you do for exercise? - Because the horse does all the work you know and mucking stalls takes no effort at all. There's a dead horse in your field. - Yup, they lie down sometimes. Doesn't it hurt when he nails the shoe to his foot? You still take lessons? I thought you knew how to ride. I used to ride as a child so I won't need many lessons. Doesn't it hurt them when you kick them with your legs? What am I supposed to hold onto? - When I take away the reins for a lunge lesson. Why is there white stuff coming out of his mouth? Have you ever fallen off? You have to feed them Christmas Day also? I don't mind getting up early, I'm usually awake by 9 a.m.
Do you rent out your horses? I used to have a dog when I was a kid so I know how to look after a horse. - Yes, I did actually have someone say that to me. What are you feeding him, I thought they just ate apples and sugar cubes? How does the horse get out of the stall to use the bathroom? What's that mark on his leg is he injured? - The chestnut. I can't count how many time I've been asked this. Have you ever eaten horse meat? Why do you need a saddle? I once rode a cowboy horse. - I think they meant western horse. How long does it take a pony to grow into a horse? Aww, that's a cute foal. - Referring to a mini. Just pull on the reins. - Advice from a parent to a child who was learning to ride a 20-meter circle. Why are those horses wearing blindfolds in the field? You can't include horse riding as exercise. - This wasn't said to me but to the parent of one of my riders by the P.E. coach at her daughter's school. I told her to tell him to come and take a lesson so he could see how wrong he was. A P.E. coach of all people??? 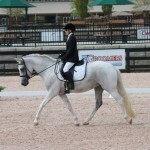 This blog isn't intended to offend non-horsey people. It's just light-hearted observations shared with other horsey friends. Feel free to add any comments and questions you have encountered over the years. Follow our every move and keep up-to-date with tips, advice, and events, etc. Posted in Random Musings. Tags: horsey, non-horsey on June 29, 2016 by Carol A. Mejia. This time last year, May 1st 2015, my husband and I rented a beautiful 125 acre property in Iron Station, just outside Charlotte North Carolina and officially launched White Rose Equestrian Center. The property came with a 16 stall barn, indoor arena, outdoor arena, many secure fenced areas, and acres of amazing trails. It's a beautiful, unique piece of land and represented my 'field of dreams'. I knew it would be hard work but I also knew I could do it. I have loved the challenge, the fresh air, and of course the horses but it also came with a fair share of stress, sleepless nights, and 13 hour days. The decision to take the barn was scary and one I didn't rush into. I crunched the numbers every which way I could and stepped outside my comfort zone but knew it was something I just had to do. There were highs and lows. Getting a 70 at my first rated show with White Rose Fandango (Annie) was one of the highs. The biggest low was telling my riders that I wasn't going to renew the lease. Renting isn't for us. We want to run a quality operation and expect things to be up to a certain standard and it's difficult putting money into a property that we will never own. So things are on hold for a while. It's been a great adventure and we very much appreciate everyone who came along with us. Here are the things, in no particular order, that I learned over the last 12 months while running a lesson and boarding barn. I would be rich if I were paid every time I said, "Put your heels down"
You can not teach your own children… anything! The bite of a horse fly hurts, really hurts! Good help is hard to come by. I am very grateful to those who were always there for me!!! You know who you are. So as we move onto the next chapter in our lives I would like to thank our boarders, riders, helpers, and volunteers. The last 12 months have been some of the most trying, exciting, funny, tiring, exuberating, rewarding, and challenging of my life. I wouldn't have missed it for the world. And as Dr. Seuss would say, "Don't cry because it's over, smile because it happened." Posted in Random Musings. Tags: Lesson and Boarding Barn on May 1, 2016 by Carol A. Mejia. Christmas is right around the corner and if you are anything like me you will have been procrastinating since the beginning of fall about when you were actually going to start your Christmas shopping. Time is running out and I know one of the most important 'people' on your list is your horse. Yes, we buy stuff for him all year round but we HAVE to splash out on 'special stuff' at Christmas time. 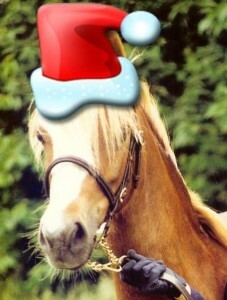 To help you decide, and also save you some money, here are seven simple ideas of what to buy your horse for Christmas. Some of them could also be used as gifts for your other horse crazy friends. New brushes to replace the worn out ones in his grooming box. Don't forget to make sure they are color coordinated with all his other important accessories. A heated bucket to stop his water from freezing. Not only does it make your life easier but a horse who drinks warmed water during cold weather is less likely to colic. A Jolly Ball for him to play with while he's stuck in his stall during inclement weather. Horses, just like people, can benefit enormously from a Magna Wave PEMF treatment. It works on a cellular level to help the body heal itself and relieve pain quickly and naturally. To show him how much you really care you could bake him some home-made treats. Not only does it save money but you can be sure you know exactly what he is eating. You know how photogenic your horse is and how much you like to show him off to your friends. Why not book a photo session for when the weather picks up? Another good idea would be to buy yourself some lessons. A balanced rider makes for a happy horse. I hope some of these ideas have helped you. If you have any ideas to share, let us know on our Facebook page. Posted in Random Musings. Tags: horse gifts on December 4, 2013 by Carol A. Mejia. Intercollegiate Dressage Coaching Here I Come! Back in the summer on the way to one of the local shows I happened to car-pool with Bailey, the team captain of the University of North Carolina, Charlotte's Intercollegiate Hunt Seat Association team. Wow, that's a mouthful - UNCC IHSA for short. Anyway, we got to talking and I casually asked if they also had an intercollegiate dressage team. Turned out they didn't. So, in kind of a half serious, half joking manner I said, "I'll coach a dressage team for them." Fast forward a few weeks and I'm told that they had formed a dressage team and that I was the coach. Awesome, nervous, excited… WHAT??? Were just a few thoughts that ran through my head. Knowing absolutely nothing what-so-ever about Intercollegiate Dressage I attended the team meeting along with the hunt seat coach. I met some of the riders and was happy to know that Blair had ridden on an IDA team before. She had also volunteered to be the team captain. Things started to fall into place. The team consisted of Blair, Iman, Taylor, Cody, and MacKenzie. Lessons started early September. My first task was deciding which level each rider should ride. Not being familiar with the running of an IDA team and not knowing what the competition was going to be like it was not an easy task but I knew the tests they would have to ride so I based it on that. Blair had ridden Introductory before and hadn't earned enough points to move up so that one was easy. Cody and MacKenzie were both competent riders but also riding on the hunt seat team which meant I would only teach them every other week. It's difficult undoing a forward seat in just sixty minute once a fortnight. So, Cody went into Intermediate with Blair and MacKenzie into Lower Training. Iman is originally from Germany and had ridden dressage before so she slotted nicely into Lower Training and so did Taylor. Our team was set… until Blair told me that we needed to have at least one Upper Training Level rider also. Taylor was the most 'aggressive' of my Lower Training riders so I bumped her up, without telling her I will add. She took the move very casually, thankfully. Lessons consisted of a combination of basic equitation and riding position improvements and fine tuning the movements in the tests. We rotated between the horses available to us and developed a weekly routine. I saw huge improvements in no time at all. Blair and Taylor practiced at our own Introduction To Dressage Show and we began to get excited as the first show official Intercollegiate Dressage show drew closer. Posted in Random Musings. Tags: dressage, IDA, Intercollegiate Dressage on October 28, 2013 by Carol A. Mejia.